It's time for a little throwback! Look at how much her locks have grown! 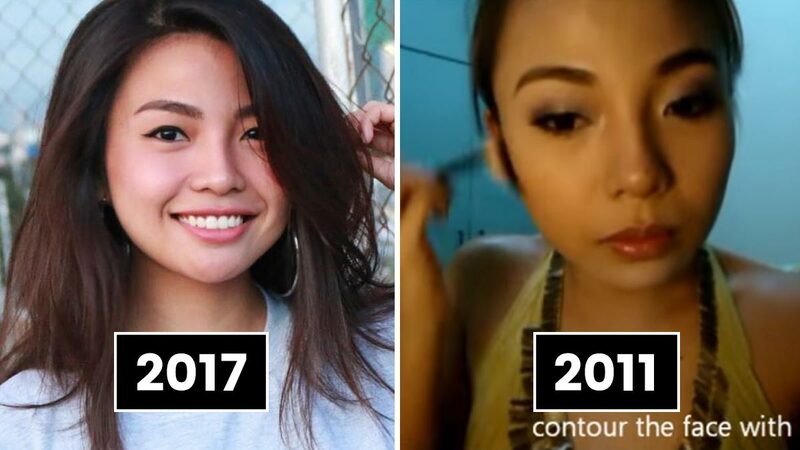 No wonder so many Pinays watch Keren for her hair hacks, tips, and tutorials. While her channel's focus is mainly about hair now, six years ago she was all about eyeshadows and lipstick! Just check out this classic Demi Lovato-inspired makeup look. In addition to creating content for YouTube, Michelle is also an ambassador for various beauty brands and gives talks about blogging. Once a beauty girl, always a beauty girl. Michelle uploaded her first makeup tutorial on how Filipinas can do an everyday smoky eye look! Janina has now expanded her channel's content to include more celebrity interviews, fun challenges, tips, and travel. Her current content is mostly lifestyle now, but two years ago, she started her channel with a good old makeup haul. Anna has grown into quite the fashionista. Her channel is still all about makeup tutorials, but her IG is filled with her OOTDs. Her fresh face was the perfect canvass for an Angel Locsin-inspired MOTD! She still loves pretty much anything that has to do with beauty. For her first post, Anne gave makeup tips on how you can avoid looking losyang—Filipino slang for "tired" or "haggard." Aside from filming hauls and swatches, Kristine now also vlogs her trips and does crazy challenges like eating spicy noodles and using chalk to color her hair! While she's all about makeup right now, her first video was a cute DIY for nail art! It was then followed by tutorials on summer and pastel rose-themed nails. She's now married and is still passionate about fashion and beauty. In less than three minutes, Charmaine showed off her school outfits from Monday to Friday! Anna's YouTube channel is thriving, and she also gives talks and workshops at various events. Aww! Anna's first video blog, or "vlog," was about her life with her two adorable Pomeranian dogs. Alexa is one busy girl! Aside from her YouTube channel, she's also a singer, actress, and dancer. Her latest album is titled, "To The Moon And Back." First Video: My Benefit Haul! Here's another beauty vlogger who decided to start her channel with a makeup haul! The hot momma continues to vlog and feature fun tutorials and hauls. Clocking in at just 25 seconds, this vlog shows Isha walking around the mall with her parents!